/ How do I Create an Awesome, Even Wash of Stage Light? You’ve got lights, dimmers and a console all setup and working, but when you turn everything on you’ve got huge dark spots on your stage. Have you ever had a presenter walk into a dark spot and cause your audience to lose focus? Do you know what it’s like to not be able to see one of the band members over in the corner when they suddenly break out into a solo? That’s right – even with all of the right gear setup and working, you still may not have what you want without a little knowledge on how to create an even wash of light. So How Do You Create an Even Wash of Stage Light? As we went over a few posts ago, each lighting instrument has different capabilities, and different methods and techniques to focus them. When creating a wash, or an even spread of light from multiple fixtures, it is important to have 2 things consistent- fixture position and lensing. You need to make sure that all of your fixtures are the same distance from the stage that you are lighting, and hopefully spread out horizontally and evenly to be at the 45 degree angle for 2-point front lighting. Then you need to make sure that all fixtures have the same lenses or beam angle– so that they have the same brightness by time they get to the stage! As I mentioned in the video, you may also want to add diffusion gel to soften the beams for a even more flattering light. You next want to position the lights in a 2-point layout for each zone on stage. Depending on the lens used and the size of your stage, you may have anywhere from 2-10 zones across your stage area, and each zone will be around 8′-10′ wide and tall. 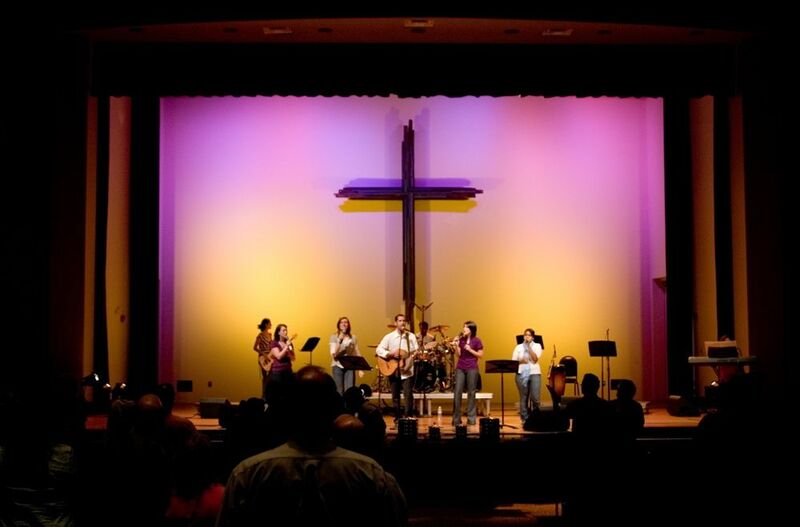 Once hung, focus your lights one at a time, making up zones across the stage that are symmetrical on either side of center. The light should overlap a few feet from zone to zone so that there are no dark spots. You will want to keep the top and bottom of each light’s beam at the same level on stage, whether that is through tilting them or using shutters if you have them. This will ensure a clean look when you have all the lights on, and keeps all of the “hot spots” in the same place. If you are using ellipsoidals, you probably want to soften the beam a little to make the edges less noticeable. If you’re using pars, make sure that the lamps or lenses are all spun in the same direction(probably either horizontal or vertical for this). It’s a good idea to always start with all the par lamps turned horizontal when hanging the lights, so that you have the same starting point. If you’ve done a good job, at least with a evenly hung rig, when you get back to your console you should be able to bring all of the faders up to the same level and your wash should look fairly even, with no dark spots. If you do a lot of work with video, a great investment to save you time is a light meter. A light meter allows you to see exactly how bright a certain position is, and then you can turn the meter to find which angle of light needs to come down or up. If your lighting positions aren’t quite even due to things out of your control, you can adjust the faders a little to make the wash more even. As long as your console cuts and boots aren’t drastic (more than 40%), you won’t need to worry about the shifts in color temperature. If you are also focusing color washes, use this same approach to make them look consistent to each other for when you mix and switch colors. Keep in mind that this approach works with any type of fixture, and you can mix fixtures in different washes- using ellipsoidals for white and pars for your colors, for example. Work with what you have and use this guide to go make your lighting rock! I am with the Volunteer Stage Crew at our local theatre and have been for 6 years. I absolutely love working with lights but do not have a lot of experience or confidence. Recently I did a show with the assistance of our production supervisor. Last weekend I learned that I was in charge of lights for a local show and googled info-which took me to your site. I just wanted to thank you for the tutorials, they were really informative and provided me with answers and confidence and although I still have learning to do I actually prepard the lighting for the entire show, ran it and taught a new volunteer!